Sciblogs | A pivotal species? What’s that? By the end of the school year, Year 13 students preparing for Schol Bio should have a pretty good grasp of the concepts and content they’ve encountered in their studies. What tends to throw some, though, is the fact that the context used for each question will almost certainly be something that they haven’t come across before. 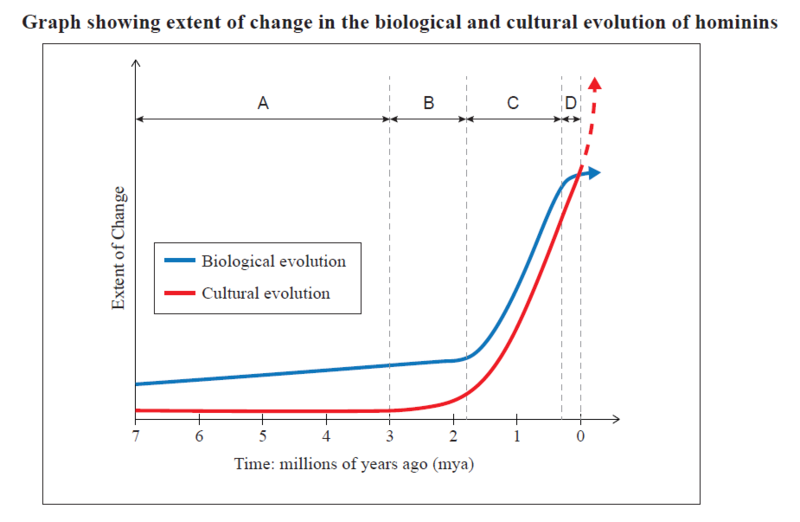 compare and account for the differences in the rate of change for biological can cultural evolution shown by the graph. Refer to each of the timespans indicated (A, B, C, D)** in your comparisons. The biological changes were associated with enhanced bipedalism (e.g. decreased size of the nuchal crest, more central position of the foramen magnum under the skull) and other adaptations to a terrestrial lifestyle. Students could have mentioned species like Ardipithecus ramidus (4.4mya), with its mix of early adaptations to bipedalism with some evidence that it still entered the trees from time to time, Or the earlier Sahelanthropus tchadensis, which at 6-7mya shows intriguing signs of early bipedalism. Either way, at this point in our evolutionary trajectory, there were probably feedback loops between cultural and biological evolution, with changes in one allowing (or perhaps driving) changes in the other. And then fire. Fire provided a range of benefits. Heat and light are the most obvious: heat would open up colder environments for occupation, while light would extend the amount of time available for various tasks and activities. But in addition, cooking changes food. It softens it and can make nutrients more accessible; it kills parasites; and processing food can also detoxify some poisons. These things have a big positive impact on diet (and potentially on brain size and complexity – but see the comments above). The post a pivotal species? what’s that? appeared first on BioBlog.